How Does Asbestos End Up in Crayons? Asbestos is a fibrous mineral that is mostly known for its insulating and fire-retardant properties. It was once commonly used in insulating, industrial, and construction products, but why would it be in crayons? The answer is talc. Talc is a naturally occurring mineral mined from the earth. Asbestos and talc can be found in close proximity to each other. Crayon manufacturers often use talc as a binder in the wax. Unfortunately, the talc can be contaminated with asbestos fibers. Some manufactures purify the talc to eliminate asbestos contamination, but there is no regulation that requires it. As such, there is the strong possibility that not all manufacturers go through this purification process. The Playskool crayons in question were made in China which happens to be one of the world’s primary users of asbestos in manufacturing. Additionally, many talc deposits in China are known to be contaminated by asbestos. China is not bound by the same safety laws as in the United States. The crayons did not have an “approved product” seal from The Art and Creative Materials Institute, a manufacturer’s association that promotes safety standards in art materials. 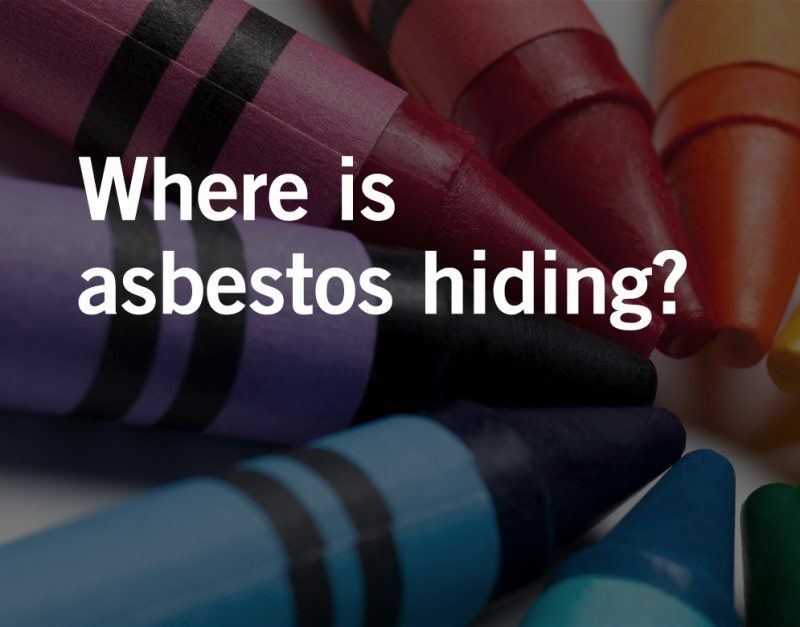 This is not the first time that asbestos has been found in crayons. In 2000, the U.S. Consumer Product Safety Commission reported finding the mineral in several other brands of crayons. Again in 2015, the Environmental Working Group also found asbestos in crayons manufactured in China and sold to American children. Despite the known dangers, manufacturers claimed that asbestos poses no threat when it is contained in crayon wax. The problem with that line of thinking is that everything, including crayons, gets old at some point. The crayons dry out over time causing them to break apart and the asbestos fibers are then released into the air. Crayons are not the only product marketed to children found to contain asbestos. Makeup sold at popular tween clothing store Justice was found to be contaminated with asbestos fibers in an investigation conducted by the Scientific Analytical Institute. Like crayons, talc is a common ingredient used in grooming and beauty products, even ones for children. Furthermore, the latency period for asbestos-related illnesses is often 30 to 40 years, so children may not show symptoms until their 40s or 50s. How Can Waters Kraus & Paul Help Victims of Asbestos Exposure? Waters Kraus & Paul has been representing asbestos victims for decades. The asbestos attorneys of this mid-sized plaintiffs’ firm aggressively fight to hold negligent corporations responsible for their use of asbestos and failure to warn the public of its hazards. Email or call 800.226.9880 to discuss your potential lawsuit with the experienced asbestos attorneys of Waters Kraus & Paul.